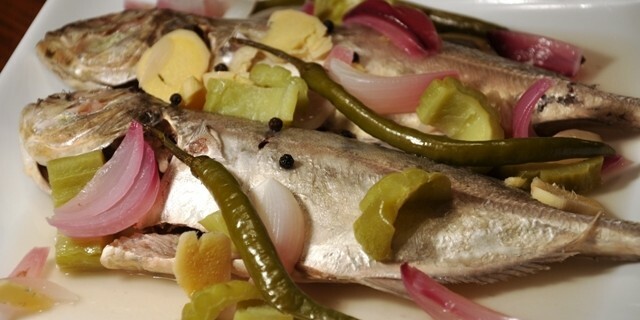 Paksiw na Isda is an ideal dish for my family back in the days in the Philippines. This simple dish is not only delicious it also does not required refrigeration and not having have a refrigerator back then this dish was often found in out dining table since it can set for a couple of days without any worry that it will go bad. Paksiw is quick and easy to make and it will satisfy the taste buds of your entire family and if you have leave over rest assured that it will taste just as good the next time you serve it to your family. 1 Bring the garlic, ginger, peppercorns, water and vinegar to a boil in a clay, enamel or non-reactive pot. Add the fish sauce and chilies, and simmer for 3 minutes. 2 Add the fish and oil and simmer, covered, until the fish is cooked, about 10 minutes. Garnish with freshly sliced spring onions and serve immediately.